I read a review on another blog and knew I hadn't read this book even though I thought I was all caught up on this series. So I went and looked and sure enough I had it on my bought list but it wasn't on my Kindle so I downloaded it and read it. I don't know how this one slipped by. I'm a huge fan of this series so I was happy to re-visit shiftertown and see some of the characters that I've grown to love and meet some new ones. Mason McNaughton needs to find a rare shifter healer and soon, otherwise he might just end up dead. 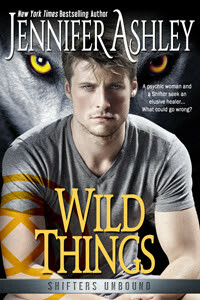 While there's nothing wrong with him, there is a feral shifter living in his home who is losing his mind and could kill him. He finds Jasmine who should be able to find the elusive healer and while searching for him they end up really liking each other. I really liked this couple a lot. Jasmine is reluctant to fall for Mason since she was hurt by a shifter in the past and Mason isn't really fond of humans but these two were really sweet together. Jasmine is psychic and her house is sentient. I just loved this house and I love how it makes an appearance in the series in other books after this one. A sentient house sure makes for some fun moments, especially if the house doesn't like you. I absolutely love Zander and since I've already read his story, I really liked reading this and seeing how he was found. Zander is the shifter healer and he's magnificent. Big, brutish and a polar bear shifter. What I really like about this series is the world building, the great characters and the story line about the collars the shifters have to wear. I can only hope that at some point in this series, these shifters start to get more rights, less discrimination and won't have to live with collars on.